Thread: My Spydie went fishing! Spent a nice day out fishing for King George Whiting with my son and his family yesterday. My Spyderco Salt accompanied me for General Duties. It gets to cut up the bait and spike the fish before they are placed on ice. Because we mostly use squid for bait the knife ends up looking pretty grotty by the end of the day! We got on to some very nice Whiting. The largest went 49 cm. With many over 40 cm! That's some nice sized whiting mate! I have the same knife, with black handle, and use it to cut bait too. Best part is not having to baby it knowing it will never rust. How good is the salt series! Whilst definitely not my favourite knife, my little dragonfly salt is probably the most practical knife in my little collection and gets used more than most (apart from my work knives). Nice fish! Mostly pan fried in egg and bread crumbs! When out in my kayak,I have a little Salt 1(full serrated) attached via hoochie cord to my life jacket for when things go pear shape! Also have the Pacific Salt for cutting bait,great little blades. Anyone else here excited about the new Salt Native 5? Yes, definitely - I’m debating whether to get that or a Salt Wharncliffe Delica at the moment. A sheepsfoot Caribbean is definitely on the cards, too. Nice work Dutchy. There’s few better feeds than fresh caught panfried King George Whiting, I reckon. Yeah, I’ve been appreciating the Salts much more this summer too. It’s been hot and humid, and I’ve been spending a bit of time in hothouses growing chillis. I’ve even been getting (mild) rust spotting on S30V, S110V and AEB-L, for the first time really in my use. I’ve been favouring the Pacific Salt and Tasman Salt heavily. 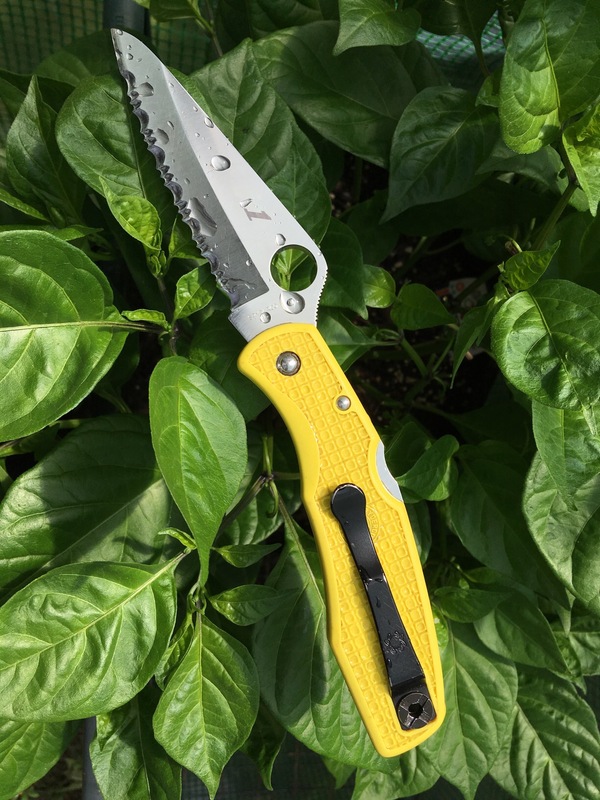 It’s a boon to have a knife you can use for pruning and trimming any old or pest afflicted leaves away, then dip it in a container of soapy water, shake it off, and move on to the next plant, no worries. Here’s mine on a Carolina Reaper plant. Last edited by 5ycamore; 10-01-2019 at 09:16.